It is time, my friend, to tell you the tale of the first musical I ever loved. A little ditty, penned by maestro of cheesy musicals Andrew Lloyd Webber, entitled Starlight Express. 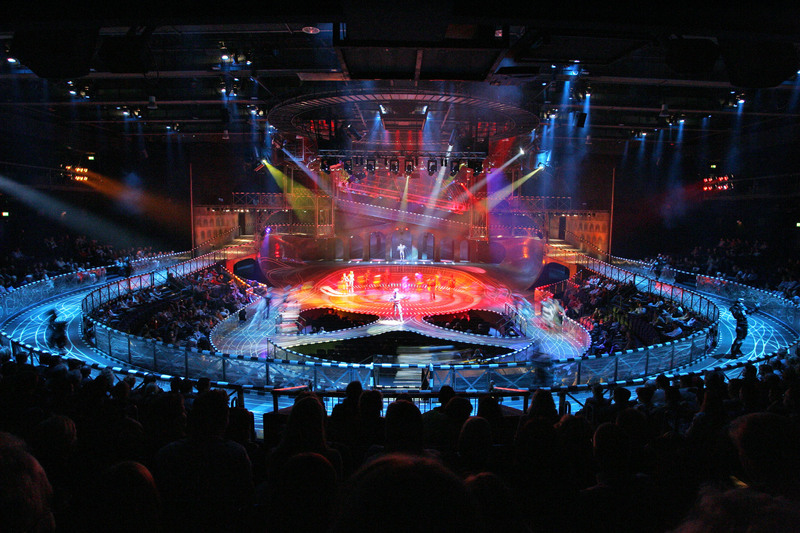 If I recall correctly, my exposure to Starlight Express began with its end. When you were a kid, Frank, did you have to sing songs in recitals? We did, with our teachers drawing from an eclectic mix of pop music and musicals. I do not know what it was like to be a grown adult, listening to a bunch of eleven-year-olds singing Bryan Adams’ “Everything I Do, I Do It For You,” but I’m sure it was pretty memorable. Anyways, when my third-grade class sang Starlight‘s big finale number, “A Light At the End of the Tunnel,” I liked the song enough to ask my parents for the original cast recording. The funny thing is, despite not having had a tape player for the last decade or so, I still remember large chunks of Starlight‘s lyrics, which I have been singing in the shower for the last twenty-odd years. Particular favorites: “The sound’s too loud/The light’s too bright/My chains are too heavy and my shoes are too tight” (from “One Rock ‘N’ Roll Too Many”) and “My name’s Pearl/I’m a brand new girl/My springs still bounce/My fans still whirl” (“A Lotta Locomotion”). You might think these lyrics make more sense in context. Honestly, they don’t. Here’s the plot of Starlight Express, Frank: A bunch of anthropomorphized trains have a big race in the mind of a child. Yep, anthropomorphized — trains which act like people. Stop laughing! I’m not making this up! I swear! This show’s been performed thousands of times since premiering in 1984! It was on Broadway! Look, here’s a video and everything! Basically, Starlight was Cats meets roller derby meets the 1980s, and you might be saying to yourself, that sounds terrible, and it might be? I really couldn’t say. Like anything you get obsessed with at the age of 8, perspective is hard to come by. The first act of Starlight is spent introducing Rusty the plucky steam engine, his rival engines (which are far more technologically advanced, being as they are powered by diesel and electricity) and the girl coaches who (on stage) literally would “couple” with the boy train engines by holding onto their hips and skating behind them. There are some races. Rusty sings to “Starlight Express,” who I think is the God trains worship? Then, in the second act, there are more races. Rusty wins the big one. A debate is had as to which is the superior energy resource for powering trains, with the ultimate answer determined to be steam power, because trains powered by steam have control over their lives, whereas diesel and electric trains do not, because EVERYTHING IN STARLIGHT EXPRESS MAKES PERFECT SENSE. The big finale number, which as aforementioned was the song we humble 3rd graders performed for an audience of parents, is about “James Watt, the schemin’ Scot/the man who watched the pot and said ‘Hey, I’ve got/A brilliant plot/When the steam gets hot/It seems to make a lot of power” — which is the only reason why I remember who invented the steam engine. This song also contains the line “Just dig a hole and haul out the coal.” That’s right, Frank, much like at least one of this year’s presidential candidates, Starlight Express advocates a return to clean, natural coal power! Of course, I never heard any of this for real until I was 12, because this was the dark ages, when theater productions didn’t find ways to sneak online. I had only been able to imagine what the roller-skating trains would be like! However, in between my original cast recording and the show we ended up seeing, Starlight had gotten a massive overhaul. Songs were different! Characters were gone! And the voices I’d spent years trying to imitate? They were DIFFERENT. It was like the songs were being sung by completely different people! The arena was pretty cool, though. Roller-skating trains! 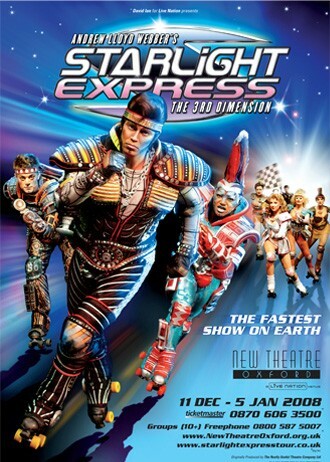 I left the theater very very confused, and the truth is, I never really loved Starlight Express the same way afterwards. Maybe it was hearing a grown man sing “AC/DC, it’s okay by me/I can switch and change my frequency” that made me rethink things — even though I had no idea that Electro, the anthropomorphized train singing the AC/DC song, was actually singing about the fact that he would “couple” with female OR MALE trains seriously not making this up. It was far from the first or last time a piece of media has disappointed me, but it was the first time I understood what separates theater from film or TV — it’s alive. It grows, it changes — sometimes for the better, sometimes for the worse. But it doesn’t sit still. It’s always evolving. And there’s something incredible about that. And seriously. No one wants that. Posted on November 13, 2012, in All the Spoilers, Theater and tagged alternative energy sources, Andrew Lloyd Webber, anthropomorphication, metaphor, musicals, Starlight Express. Bookmark the permalink. 2 Comments. Starlight Express, Starlight Express, are you real, yes or no? Starlight Express, answer me yes! That show was in Vegas for a while at the Hilton back in the 90’s; I knew quite a few members of the cast.. The Red Caboose (who was also Rusty’s understudy) was the man who taught me how to dance in high heels, yes indeed. Along a similar vein, I saw Cats on Broadway when I was a kid and it was AMAZEBALLS. Saw it again on tour in LA a few years ago and it was a different kind of balls.